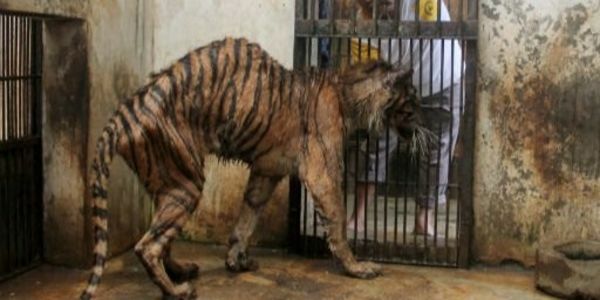 petition: Close Surabaya "Zoo of Death" Now! Surabaya Zoo is the largest in Indonesia. The almost 3,500 animals (a figure from 2014) kept in this gruelling zoo, endure a life sentence of abuse and neglect – one that frequently ends in a death caused by the horrendous conditions or treatment they are subjected to, with an estimated 25 animals dying a month from unnatural causes. It is clear there is a lack of consideration taken towards the safety measures and welfare for the animals; Surabaya's only giraffe died and was found to have a 40-pound ball of plastic in its stomach. This disturbing incidence brings the question of how a situation had been allowed to happen in which the poor giraffe became exposed to the opportunity for a beachball-sized wad of plastic food wrappers to enter its belly. With occurrences ranging from a Bengal White Tiger with a missing ear and spinal problems, to a sick 35-year-old female elephant suffering swollen joints in her leg, to an African lion found hanged to death in his own cage: this zoo is a nightmare where a number of animals have perished due to neglect, starvation and mistreatment. Please sign and share the link to this petition to help support the fight to close down the horrific Surabaya "Zoo of Death"!